SUFFIELD, Conn. – Savage Arms is pleased to introduce several new products at the 2016 SHOT Show. The A22 22 Magnum is one of the most exciting introductions, proven to deliver accuracy and reliability in a semi-automatic magnum rimfire platform. Also debuting for 2016 are several line extensions in the A17 and B.MAG rifle series, as well as adding the 6.5 Creedmoor caliber to many of its AXIS and AXIS II models. In addition, the company is proud to announce the all-new Model 42 Takedown shotgun-and-rifle combination gun and several more new firearms. Stealing the modern looks of the Savage Arms A17, the first high-performance semi-automatic rimfire specifically designed for the 17 HMR cartridge, Savage adds a new model to the series. The A22 Magnum is chambered for 22 WMR and features the same delayed-blowback semi-automatic action as the original A17. 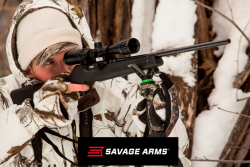 Savage Arms A17’s unique delayed-blowback action provides safe, reliable operation with standard 17 HMR loads. New 2016 target models feature heavy barrels and gray wood laminate stocks for updated styling and increased accuracy. Savage’s B.MAG was built around the 17 Win. Super Magnum cartridge, which creates unprecedented rimfire velocities of up to 3,000 feet per second. For 2016, three new models have been added to the B.MAG lineup: Target Beavertail, Heavy Barrel and Sporter. Savage Arms has added nine new rifles chambered for the hot, flat-shooting 6.5 Creedmoor cartridge. They include the new 16 Lightweight Hunter, AXIS, AXIS LH, AXIS XP, AXIS XP Camo, AXIS XP Stainless, AXIS II XP, AXIS II XP Stainless and AXIS II XP Hardwood. The new Model 42 Takedown breaks down with simple push of one button and includes an Uncle Mike’s Go Bag so you can easily transport it anywhere. The Model 42 Takedown is an easy-to-use, break-open combo gun that fires rimfire rounds from the top barrel and .410 bore shotgun shells from the bottom. These products and many more can be viewed during SHOT at the Vista Outdoor booth (#14551), with photos and product details added to the company’s web site after the tradeshow. Also at SHOT Show, Vista Outdoor will display updated logos for several brands, including Bee Stinger, BLACKHAWK!, Final Approach, Hoppe’s, and Savage Arms. Since its spin-off, Vista Outdoor has focused on strengthening and repositioning a number of its brands to better reflect the vision and brand proposition with consumers.